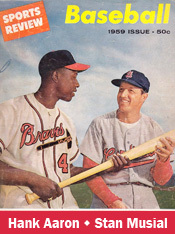 In a 1954 series against the Cardinals, Hank Aaron hit his first and second home runs in the big leagues, solidifying his status with the Braves and launching him on a path toward breaking Babe Ruth’s most storied record. Six games into the 1954 season, Aaron, 20, a rookie outfielder, was struggling, batting .217 with no home runs and no RBI. As the Braves entered a three-game series against the Cardinals at St. Louis, speculation was Aaron might be benched whenever outfielder Bill Bruton recovered from a viral infection and returned to the lineup. Aaron ended that talk with a strong series at St. Louis, hitting .500 (8-for-16) with a pair of home runs and three RBI. He went on to have a solid rookie season (.280 batting average, 27 doubles, 13 home runs and 69 RBI.). In the opener of the Braves-Cardinals series on April 23, 1954, Aaron, batting sixth and playing right field, was 3-for-7 with two runs scored and two RBI in Milwaukee’s 7-5 victory in 14 innings. In the sixth, with the Cardinals ahead, 4-2, Aaron hit the first of his 755 career home runs, a solo shot off starter Vic Raschi. The Braves tied the score with a run in the ninth and each team scored in the 13th. Aaron hit 91 career home runs against the Cardinals. Only the Reds (97) and Dodgers (95) yielded more home runs to him. The Cardinals pitcher who gave up the most home runs to Aaron was a fellow Hall of Famer, Bob Gibson. Aaron hit eight home runs against Gibson, but batted .215 (35-for-163) versus the Cardinals ace. Aaron had more strikeouts (32) than RBI (26) versus Gibson.